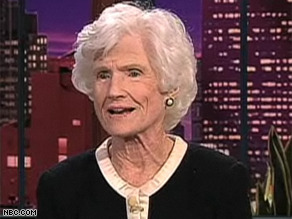 McCain's mother, Roberta, appeared on The Tonight Show with Jay Leno Wednesday. (CNN) - The always-outspoken Roberta McCain - mother of Sen. John McCain - took a swipe at Rush Limbaugh Wednesday, saying the popular conservative radio host "does not represent the Republican Party that I belong to". "I belong to the Republican Party," McCain, 97, said during an appearance on The Tonight Show With Jay Leno. "What he represents of the Republican Party has nothing to do with my side of it. I don't know what the man means, I don't know what he's talking about." McCain also praised Republican National Committee Chairman Michael Steele for labeling Limbaugh an "entertainer" earlier this year during an interview on CNN. "I think [Steele] was exactly right when he defined this man as an entertainer," she said. "To my horror, the Republican Party made him back up on it." Limbaugh has long been a critic of John McCain, publicly urging listeners to vote against him during the Republican presidential primaries last year. Most recently, Limbaugh said McCain and his outspoken daughter, Meghan, should follow Pennsylvania Sen. Arlen Specter out of the GOP. In her appearance on Leno Wednesday, the elder McCain also had some harsh words for liberal television host Keith Olbermann. "I, myself, can't figure out that type of person who really more or less gets joy out of denigrating people. I'm just not that type of person, I don't have friends like that, and thank God I am not around people like him." Common sense is just plain common sense, no matter how you look at it! Lush needs a hug, period. Because he seems like a sick fat old man without friends! Mrs. McCain is telling the truth regarding her party, which may be instinct soon if they keep letting Lush, Palin and Cheney destroy it! Roberta McCain represents the Republican Party that we used to be proud of. Seems like Meghan might be a chip off the old block there, an old fashiomed Republican with moral sense and values. I didn't vote for her son, and for me it is not about repub or demo, I like the fact that she has spoken out with such truth and honestly. I too agree that Rush speaks with such hate and he speaks dishonestly, doesn't always have his facts right. With regards to Keith, I feel that he is fair in his comments and for the most part unlike Rush has his facts correct. Thank you Mom McCain for speaking out. This woman is brighter than any male Republican out there. She does not have a need to grovel, bow down, apologize, kneel and worship the limpboy, nor kiss his big behind. Her granddaughter, Meghan, certainly has learned a lot about being a strong, independent, serious, and important THINKER. TWO REPUBLICAN WOMEN WITH BRAINS. The GOP could learn from them. Worshiping Rush is not in the best interest of the country. Just watch the male repugs keep on bowing and scraping to their master. They cannot stand up and have a single brilliant thought of their own, and even worse, THEY THINK RUSH IS BRILLIANT. DUH. McCain and family are not the Republicans that represent the Republican Party or McCain would be the President now. Christians "tolerant"? Are you kidding? Their whole religion relies on hatred and judgement. It's them versus the "sinners" aka anyione who does not think exactly like they do. Well it's good they brought out a 97 year old cheerleader to put a voice on the Republicans. Let's see how Rush responds by raking her over the coals as if she hasn't been through enough in her lifetime. Raw, Raw, Raw, Go Team Go! What an interesting lady. I like her. Go get 'em, Mrs. McCain! Good for you! she's right on Limbaugh, wrong on Keith. Of course the pallid spineless junkie will attack the old girl. It's what they do best.. I don't why people think it is only Christians that associates themselves with the Republican Party. I am a Christian and a Democrat. If the GOP relates to the Evangelicals, why don't their party support social programs to help the poor and have more minorities in their party. All I see is hatred, fear and power struggle . Some Democrats are just as bad. But if you think you are better than others, at least let your life show it. Palin potrays herself as a God fearing person, but at the RNC Convention she trashed Obama instead and call him everyname in the book except the "N" word. Come on people! I challenge any of these "Talk show" people to try to make a point without being sarcastic and using the following 3 words... Liberal, socialist, teleprompter. Ill bet they can't.... in fact I know they cant. Good for you madame McCain. It is not good for people to look at Limbaugh as representative of Republican party, he is arrogant and nasty. Republican party already have a bad image in the Bush era as unkind and greedy. I miss president Reagan years, when I was a proud Republican. Having left the Republican party because of people like Rush, it's nice to hear a little common sense once in a while. You go girl. Rush is nothing but a bag of wind. So this is news ? Any old thing to keep your man in power ! Denigrate the opposition, right CNN! God bless you Ma'am. At least we still have true veterans who recognize and point out when a comment is completely out of line, even if it means criticizing one of theirs. Republicans and Democrats who are so bent on arguing along party lines need to learn a lot from Mrs. McCain. Rush Limbaugh is a puppet of somebody else who is trying to control things. He will say anything to achieve the appropriate goal. If they think people have turned against him they will use him to criticize the person or policy they support with the hopes of a backlash response. It is called political strategy. Basically, Rush has sold his soul to the devil as have many people in the political arena. There is no truth anymore - it is all strategy. I don't trust anything he says one way or the other–it is meant to manipulate. Look for the truth in other sources and don't trust just one source. Chances are Mrs McCain is also being used for a political agenda. Anyone who stands up to Rush Limbaugh and his ilk of "ditto heads" has my respect ... and when its a 97-year-old Republican woman, I think she deserves all the accolades there are available. I do disagree with Mrs. McCain regarding Keith Olbermann. While his comments may sometimes be biting, they appear to be backed up with facts rather than fairy tales or twisted logic. I watch "Countdown" every night and appreciate that Mr. Olbermann is as critical of Democrats as he is of Republicans. Olbermann and Maddow on MSNBC get my viewing time over Campbell Brown/Roland Martin (and their insipid questions and comments) and Larry King's tabloid rehash every night. Lets get the Faternity boys out of the G.O.P so we can vote Republican again or else from a real 3rd party that will do what the people want it to do. What does a Republican do that nobody else does? You see what I'm talking about Ed?? You wanna go at it with granny, then go right ahead! LOL! !